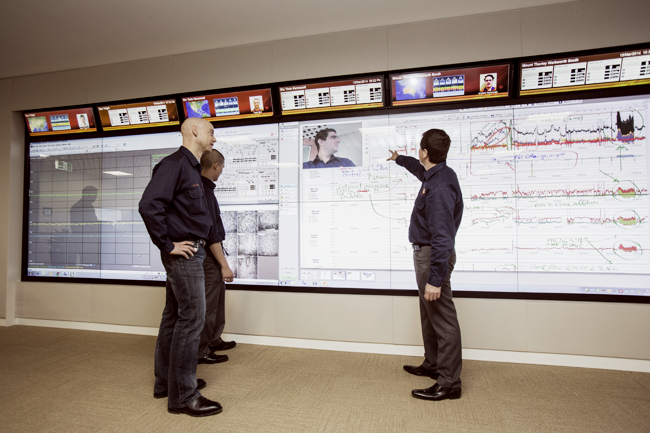 From driverless trucks to real-time solutions that maximise safety, the industry is preparing for digitalised operations. A cloud of red dust kicks up as the Komatsu truck leaves Silvergrass mine. It’s hot out here in Western Australia’s dry, remote, mineral-rich Pilbara region, and the sun bakes down as the truck drives away. It’s a huge machine, about the size of a double-storey building, and able to carry 350 tons of material. 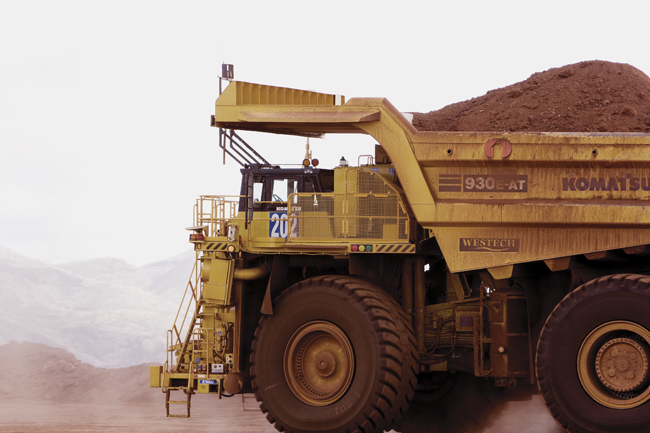 There’s a sizeable fleet of these vehicles – about 80 in total – moving around Rio Tinto’s five Pilbara mine sites, yet there’s not a driver in sight. Operated by a supervisory system and a central controller located 1 500 km away in Perth, and using pre-defined GPS courses, these trucks automatically navigate the region’s haul roads and intersections, with 45 onboard sensors allowing each truck to keep a constant log of each other’s real-time locations, speeds and directions. It’s a startling vision of the future, as driverless trucks work alongside human miners to move mining material. But while it may sound like a snapshot of the mine of 2028, it’s the everyday reality of 2018… And, as part of its Mine of the Future programme, Rio Tinto has been running autonomous vehicles in Pilbara since 2008. In fact, the mining giant’s driverless truck fleet moved its 1 billionth ton of material this past January, after passing the 100 million ton milestone in April 2013. Collectively, that autonomous truck fleet has now travelled more than 150 billion km. Technology is now the most important principle in mining. From virtual reality interfaces and big data number-crunching to driverless trucks and go-anywhere drones, digitalisation, automation and artificial intelligence are bringing dramatic changes. As Bold Baatar, Rio Tinto’s chief executive, energy and minerals, told delegates at the Mining Indaba in Cape Town, this February, those new technologies represent the industry’s biggest challenge and opportunity. However, Bold continued, the industry will find itself moving from thousands of haul truck drivers to software engineers and data analysts. It’s a daring statement, placing the mining industry alongside the tech industry in terms of the skill sets needed for the future. What does that future mean for the continent? That future is already rolling out at the University of the Witwatersrand, where Sibanye-Stillwater and the Wits Mining Institute (WMI) launched the Sibanye-Stillwater Digital Mining Laboratory (DigiMine) this past March. A simulated mining environment located on Wits’ West Campus, DigiMine features a vertical shaft in a stairwell, a tunnel and stope in the basement, and a range of communi­cation and digital systems to enable research that will help to create the mine of the future. 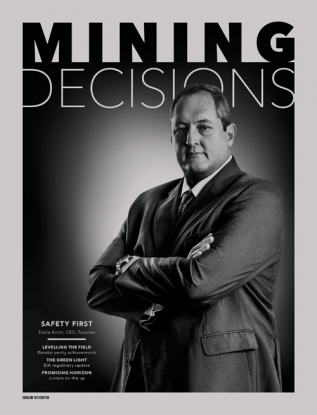 The WMI’s DigiMine project aims to make mining safer and more sustainable by harnessing fast-developing technologies and practices from different sectors – which, WMI director Fred Cawood notes, are not always incorporated into mining applications quickly enough to address the industry’s many challenges. According to Cawood, the WMI’s biggest breakthrough has been to forge working links across the university’s schools and research units, thereby allowing mining issues to be addressed in a real-world, integrated way. ‘The WMI now draws upon a formidable bat­tery of expertise and insights from disciplines like architecture, public health, law, global change, population migration, urban develop­ment, electronics and computer science,’ he says. That approach is one that the mining industry as a whole would do well to learn from. Accord­ing to PwC’s SA Mine report, digital technologies are usually driven at a line-of-business level, which does not neces­sarily deliver value across the business. ‘A typical example is using drone technology at mine level for pit surveying and mine planning, but not using it more widely for security monitoring (perimeter monitoring), detection of gas emission in the pit, identification of safety transgressions using machine learning, video surveillance ensuring all personnel are evacuated from the pit during blast, or video surveillance of mass protest action outside mine entrances,’ the report notes. 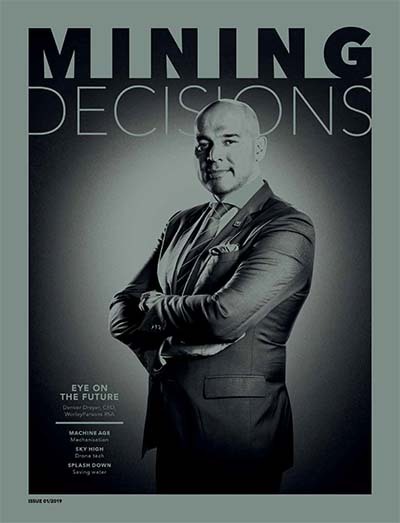 Speaking at the launch of DigiMine, Neal Froneman, CEO of Sibanye-Stillwater (which is contributing a total of ZAR27.5 mil­lion between 2015 and 2020), said the project highlights how important it is for the mining industry to harness the digitalisation that comes with the fourth industrial revolution. ‘The launch of the DigiMine estab­lishes a unique programme that is instrumental for the application of digital technologies in support of safer and more efficient mining operations,’ he said. Cawood adds: ‘This partnership … paves the way to develop digital technologies that will reduce risk in the mining environment. Safety and competitiveness are cornerstones of a sustainable mining sector, which can contri­bute to the National Development Plan by reducing poverty and inequality. Again, Cawood emphasises safety. 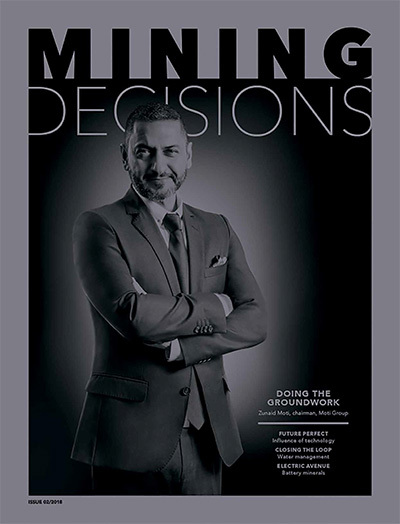 ‘The goal of DigiMine is to take technologies that work outside of mine environments – technologies like GPS, drones or communication technology – and to adapt them so that they can be used effectively underground in order to put distance between people and risk,’ he says. 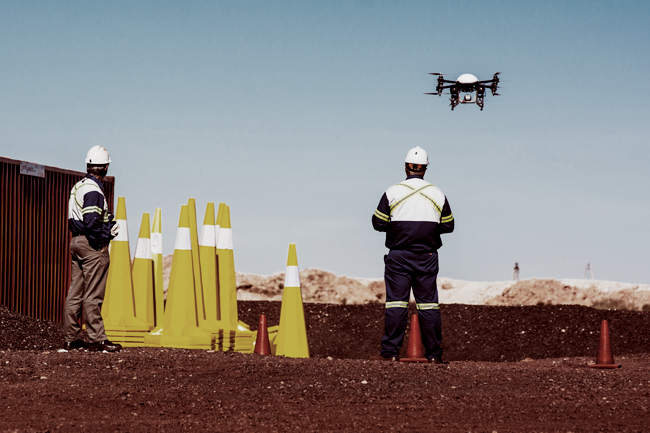 It’s no coincidence that the move towards the digital mine of the future has come at the same time as an industry-wide improvement in safety levels. As the authors of PwC’s recent SA Mine report note, ‘safety is probably one of the biggest success stories for the mining industry over the last 20 years. In a country where the general safety culture is very weak, as for example reflected in road deaths, the mining industry has done extremely well to reduce fatalities from above 1 000 a year, less than 20 years ago, to the current levels in the 70s’. The PwC report quotes statistics provided by the Department of Mineral Resources (DMR) that show a downward trend in fatalities for the industry as a whole over the past 10 years, ‘indicating that investments made in safety initiatives by both companies and the DMR are delivering positive results’. In December the WMI worked with the Wits School of Electrical and Information and the University of Bremen’s Sustainable Com­mu­nication Networks Laboratory to design, develop and test technology for tracking miners trapped inside a collapsed underground mine. The test was based on a scenario that assumed that the injured and missing miners would not be able to send distress calls. The prototype solution placed small, portable communications devices on the miners, with those devices linked through a series of nodes on a wireless network. The tests confirmed that the technology would work, even if the lost miner was hidden behind a wall of rock or debris. In a video presentation showcasing the success of the prototype, Cawood’s enthusiasm for his work is clear. 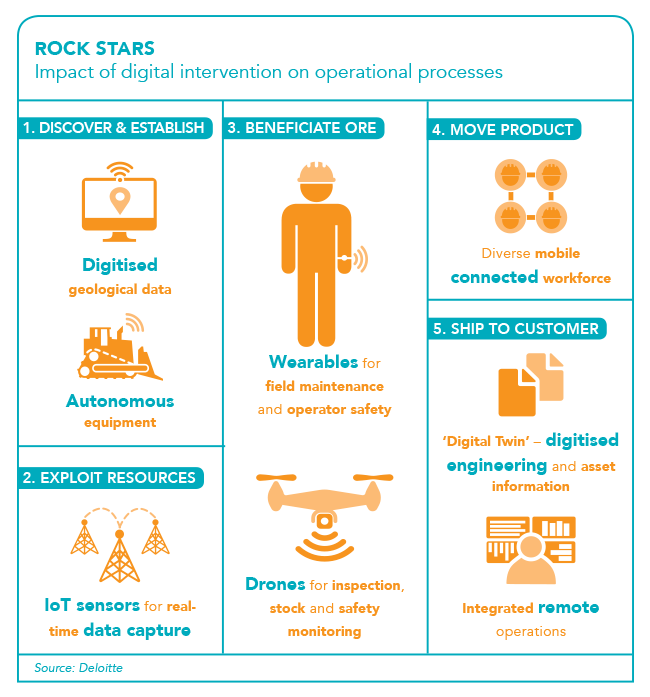 What is equally clear is how great an impact digital technology is having on the mining industry.